. High energy, speed and best ball control - andro PLAXON 450 lets anyone access these features!
. A compact medium sponge with speed reservoirs for forceful and precise offensive play. Brings the ball right to its goal without - any detours.
. The newly developed rubber surface perfectly grabs the ball and avoids any loss of energy or preciseness during the stroke.
. Decrease your error ratio while increasing the fun factor! 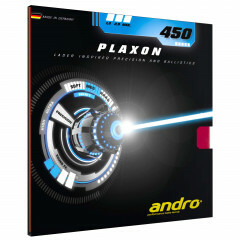 andro Rubber Plaxon 450 is beeing added to cart.